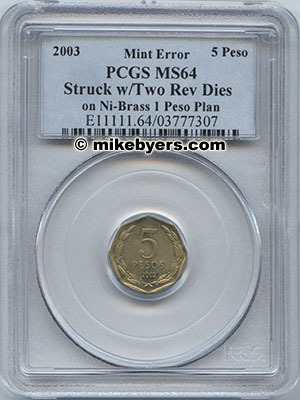 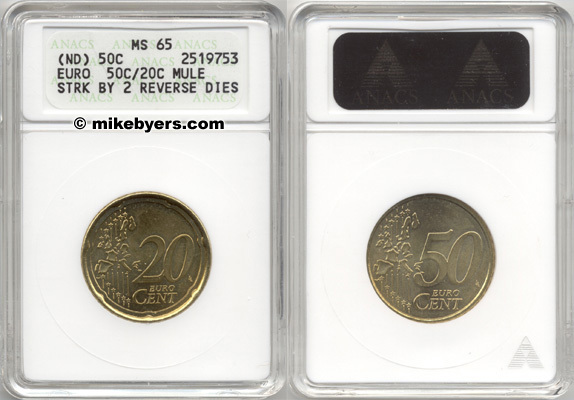 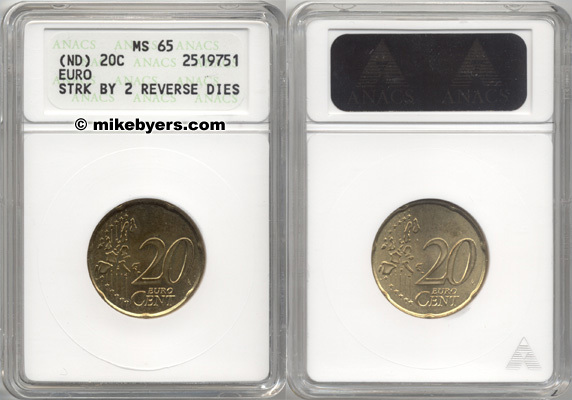 This is a unique Chile 2003 5 Peso struck with two reverse dies on a Ni-Brass 1 Peso planchet and certified by PCGS. 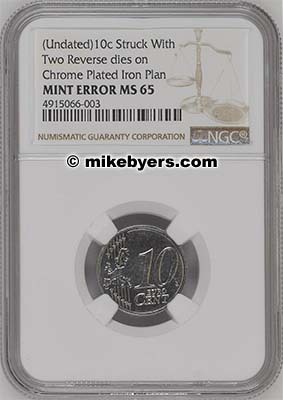 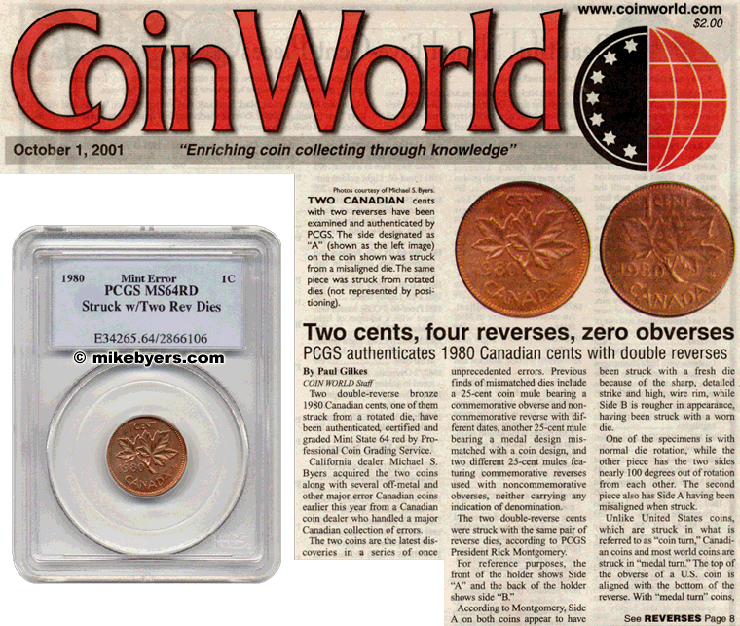 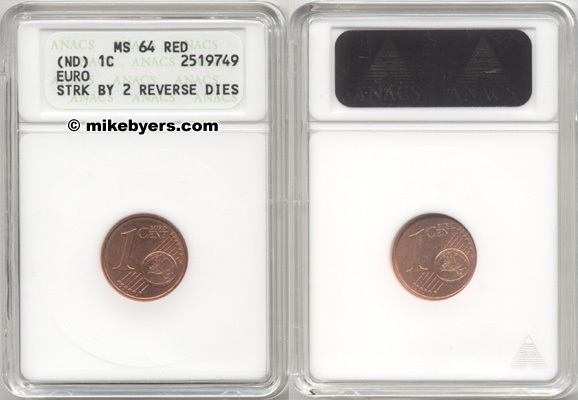 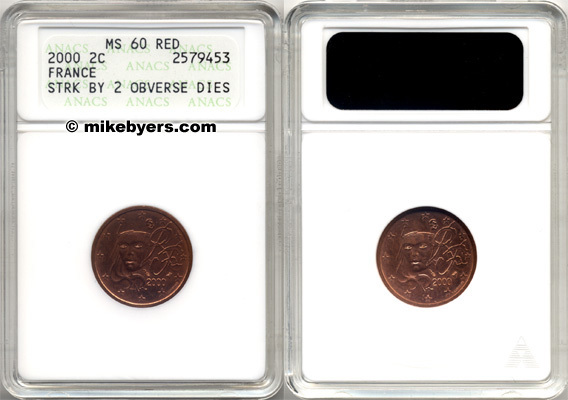 This exceptionally rare type of mint error has occurred only five times in U.S. or World modern numismatic history where a coin was struck by either two obverse dies or two reverse dies and struck on an off-metal planchet. 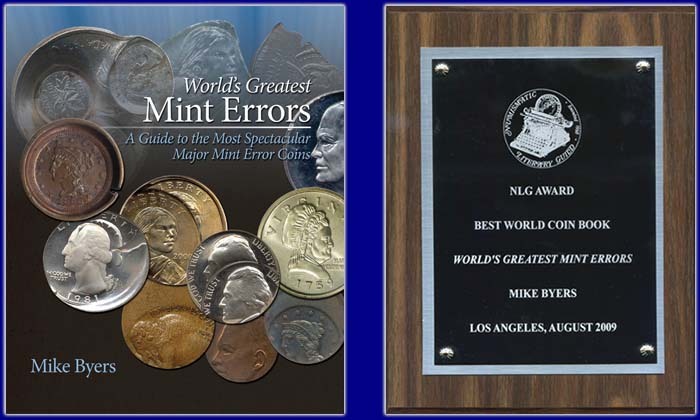 In my NLG Award winning book, World's Greatest Mint Errors, I dedicated an entire chapter to two-headed and two-tailed mint errors. 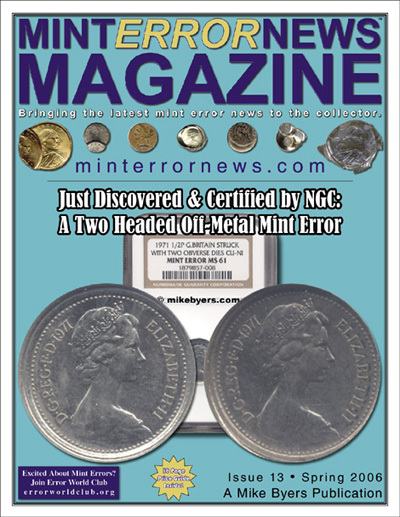 In 2001, I purchased a Canadian major mint error collection that included a few previously unknown types of mint errors. 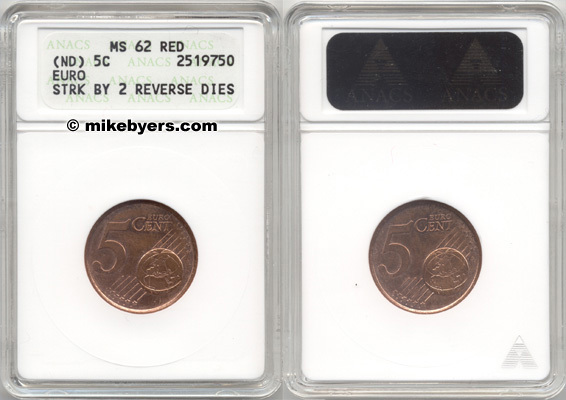 Included in this collection was a unique Canadian Cent (two-tailed) struck with two reverse dies. 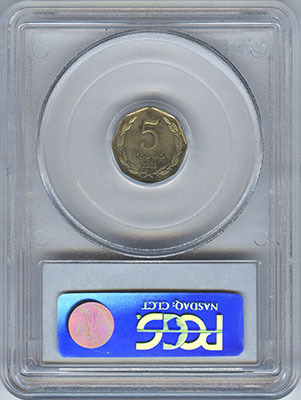 At the time this was thought to be an impossible mint error. 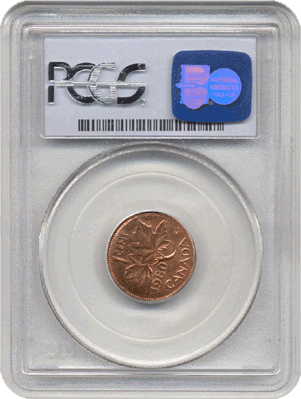 My discovery of this unique Canadian two-tailed Cent was featured in a front page Coin World article. 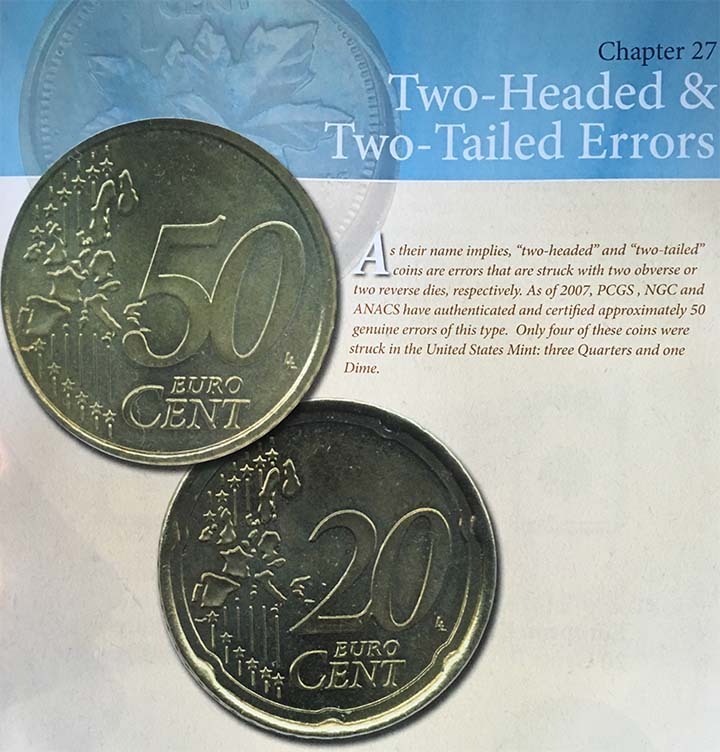 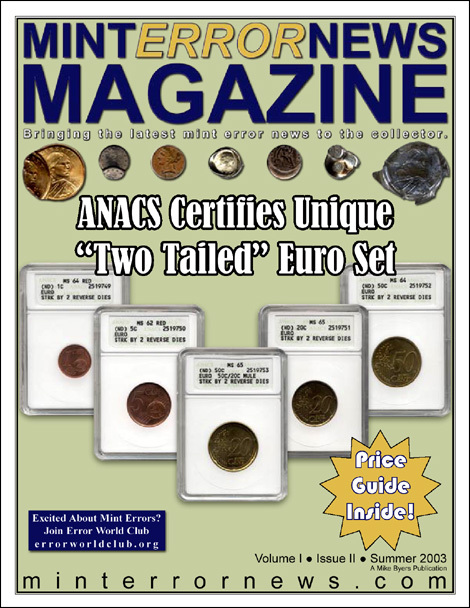 The first set of Euro coins struck with two obverse or two reverse dies was also my discovery and was featured in Mint Error News Magazine. 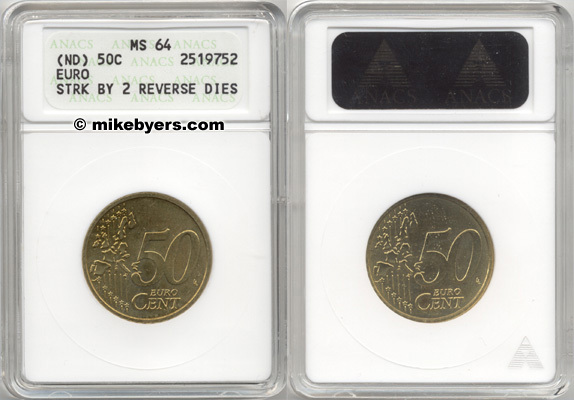 This was an amazing set of 6 Euro coins of different denominations struck with either two-obverse or two-reverse dies. 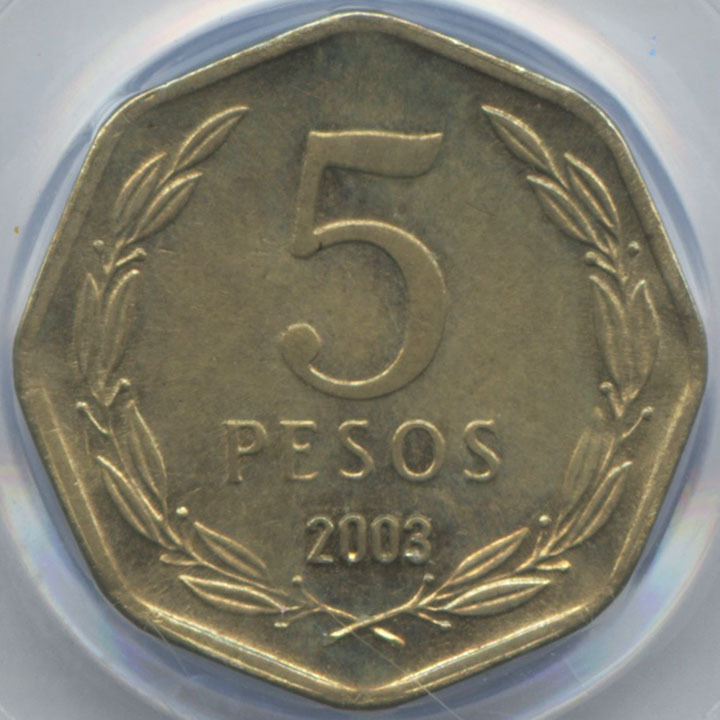 As unbelievable as it seems, here are the other times this type of mint error has occurred: a Chile 10 Pesos, a Great Britain Halfpenny, a 10 Cent Euro and a Russia 50 Roubles. 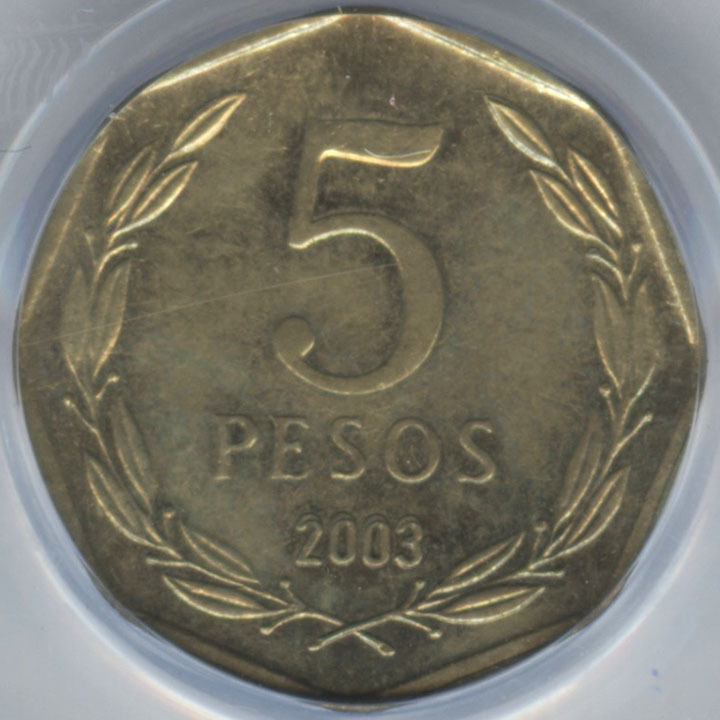 The Chile 10 Pesos was struck with two obverse dies on a Bolivian 10 Cent planchet and was certified by PCGS and is unique. 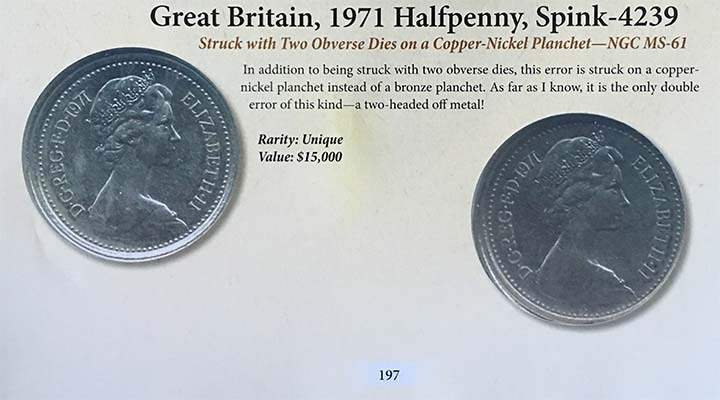 The Great Britain Halfpenny was struck with two obverse dies on a copper nickel planchet and was certified by NGC and is unique. 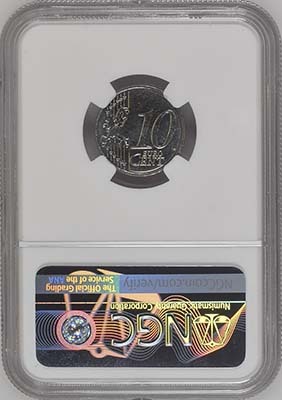 The 10 Cent Euro was struck with two reverse dies on a chrome plated iron planchet and is unique. 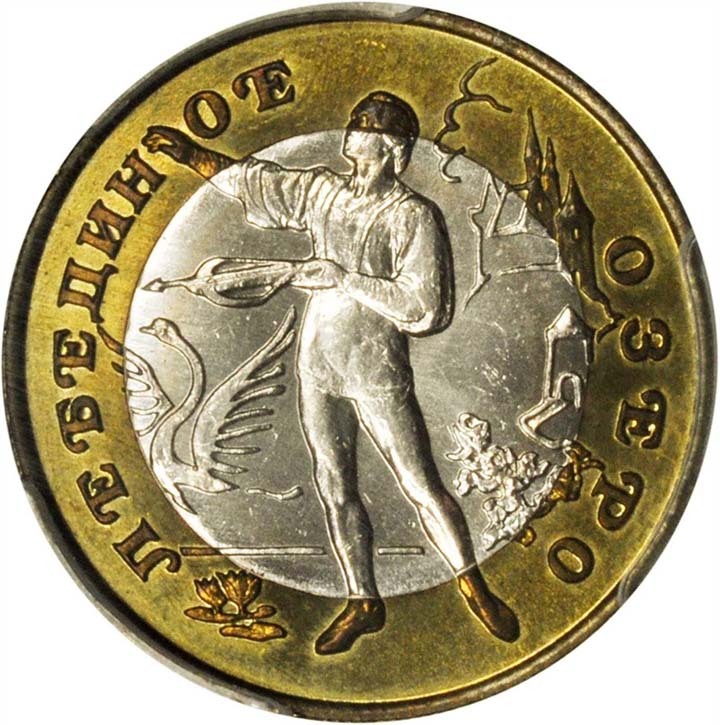 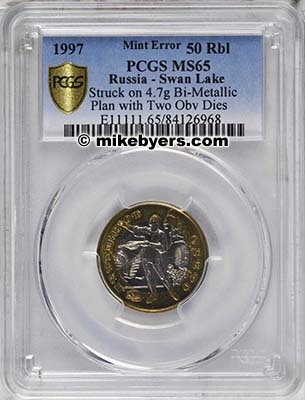 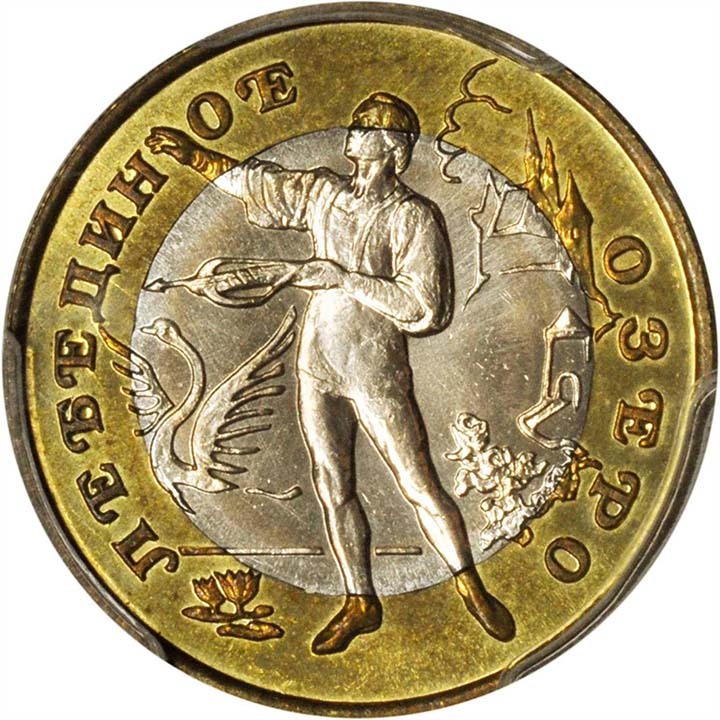 The Russia 50 Roubles was struck with two obverse dies on a bi-metallic planchet and was certified by PCGS and is one of three known.